When an employer has evidence that an employee has or may have a disability, the law requires the employer to investigate and determine whether the employee needs or wants accommodation. The Human Rights Tribunal of Ontario recently affirmed this principle in the case of Russell Sears v. Honda Canada. Significant failures of policy and practice led Honda to delay accommodations that the visually impaired Sears needed to do his job, and eventually to terminate him. Sears has severe myopia and colour-blindness. He wears noticeably thick eyeglasses and has trouble seeing red, green and occasionally yellow. A company doctor became aware of these conditions before he was hired in 2001. The doctor’s report was part of Sears’s employment record. His medical file also mentioned anxiety, stress, and depression. Sears worked in quality assurance at Honda. His work involved spotting defects in cars with the help of a computer display. In 2010, the employer proposed to change the computer display from black text on yellow to black text on red. Sears had made do with the black-yellow combination with help from co-workers and tools like a magnifying glass, and he was very concerned about the colour change. He objected and his co-workers allegedly dismissed him, one saying, “it’s not going to be changed just for one person.” According to Sears, co-worker Jim Proper later verbally abused him over the issue and poked him with a tool. The colour change went ahead in November 2010. As he expected, Sears had trouble with the new system, and he moved from job to job. But by December, “nothing had been done” and he left work “on the verge of a nervous breakdown.” His doctor prescribed anti-anxiety and anti-depression drugs. With no income, Sears returned to modified duties in June. The employer investigated accommodations but didn’t report until August. He continued to feel that the company was not responding to his needs. Accommodations were finally implemented by November 2011, but again, he had had enough. Sears asked Honda for a severance package in exchange for quitting the job and dropping his Ministry of Labour and human rights complaints. But he felt the offer was too low and took back his resignation. The employer responded that it was too late. The uncoordinated conditions created confusion that unnecessarily delayed the accommodation process for Sears, frustrating the already stressed worker to the point of anxiety and depression, and eventually leading him to offer to quit if the employer would just give him a fair severance package. To compensate for the discrimination and the “humiliation, hurt feelings, anxiety and loss of self-respect…lack of confidence and…dignity,” that Honda’s actions caused Sears, the tribunal ordered an award of $35,000. For loss of income, the tribunal ordered Honda to pay Sears half his salary for the period from December 2010 to June 2011 when he was off work but was denied disability benefits, plus one month full salary for his leave from February to March 2012. In short, employers have a duty to inquire about an employee’s condition and possible accommodations. 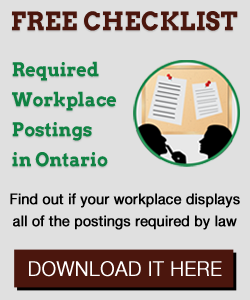 The 2005 tribunal case of Laskowska v. Marineland offers a handy list of questions employers can use to guide their response to requests for accommodation and alleged discriminatory incidents. If the complainant chose to return to work, could the employer provide her/him with a healthy, discrimination-free work environment? Did it communicate its findings and actions to the complainant?